JT is bringing Christmas spirit to the High Street with a FREE in-store gift wrapping service. This is to raise money for the company’s chosen charity of the year –The Jersey Alzheimer’s Association. In the lead up to Christmas, JT employees from across the company have volunteered to gift-wrap customers’ tech gifts free of charge. In exchange for this they ask for a small donation to the Jersey Alzheimer’s Association. This is JT’s chosen charity for this year. 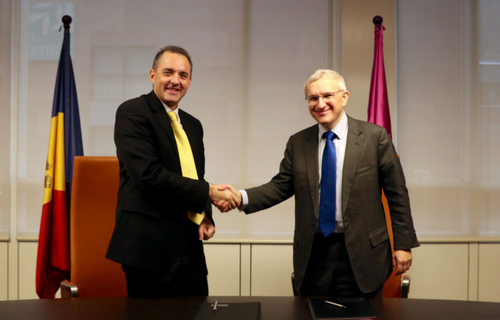 JT has signed an exchange agreement with the national telecoms company of Andorra to work together. This will be in areas such as the Internet of Things (IoT) and information security. The cooperation programme will also promote the professional development of employees. Staff will be seconded from JT to Andorra Telecom to share knowledge and experience. But also to identify how the companies can work closer together and promote multicultural and dynamic working environments. The agreement was signed in Andorra on Monday 11 December by JT Chief Executive Officer Graeme Millar and his counterpart at Andorra Telecom, Jordi Nadal. Mr Millar said: “Like JT, Andorra Telecom is a government-owned company. And it punches above its weight on the international stage. We’ve both invested in full-fibre broadband networks. Additionally, we’re both developing innovative IoT services to help devices connect with each other automatically. This partnership makes perfect sense because we’re moving in the same direction. But, we still have a lot to learn from each other. Mr Nadal said: “From Andorra Telecom’s perspective, we’re particularly interested in JT’s knowledge of networks. JT’s work in the IoT space and the way it has expanded globally is impressive. Equally, I hope our own experience in fibre-optic technology and information security will be of great interest to JT.